It has been a while since my last post here and some important events have taken place in my life. I moved again, started looking for work, learned to spin (yarn), watched all of Law & Order in chronological order on Netflix, started exercising very minimally, and bought some sneaker wedges. 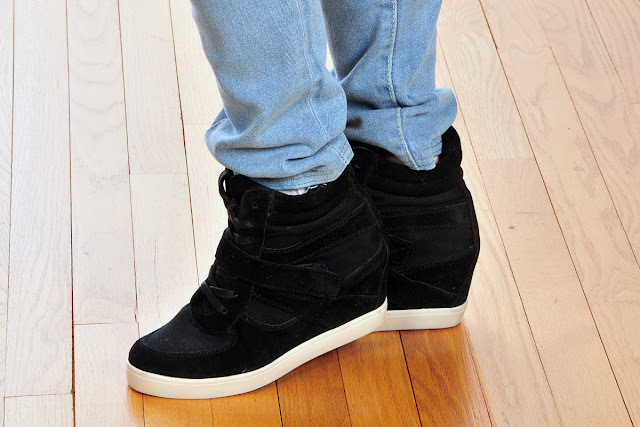 Yes, plain black Steve Madden sneaker wedges. They are a bit boring, but they go with everything. 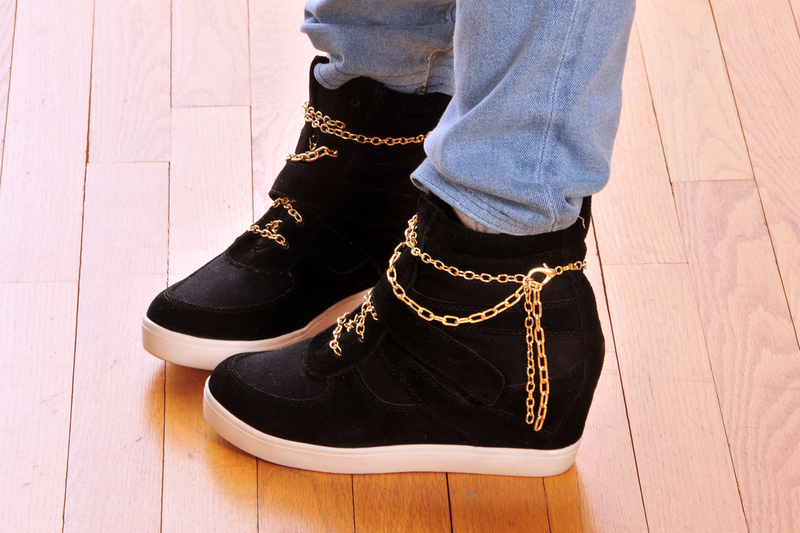 They can also be transformed into blinged out, gold chain, swag shoes fit for a rapper. See what a simple change of laces can do? These are no longer just shoes, they can officially be called $HOE$, or $NEAKER$ And you can go back to black laces any time if you want. 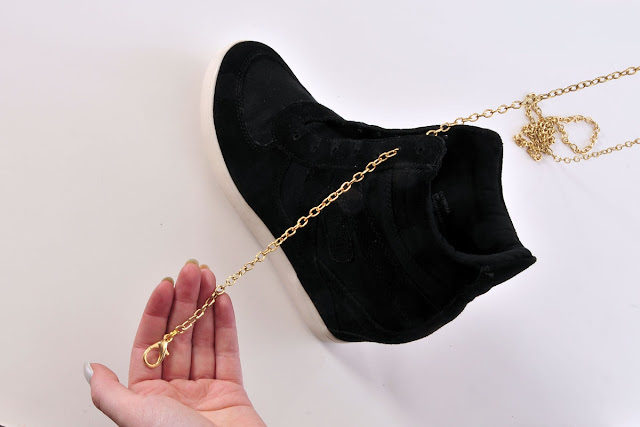 1 or 2 types of chain at least as long as your laces, make sure it fits through the holes in your shoes. I got my chain at the local hardware store for about 70-90¢ per foot. 2 9mm split rings, regular jump rings may not be strong enough. 2 lobster clasps, I chose the largest size available at the craft store. 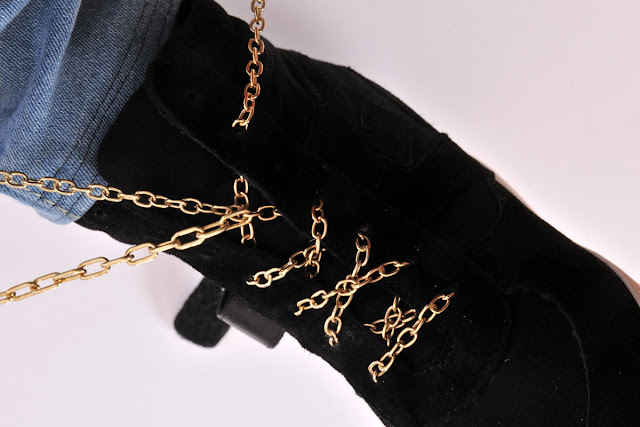 Chains do not tie very well, so the clasps are instead of a bow or knot. 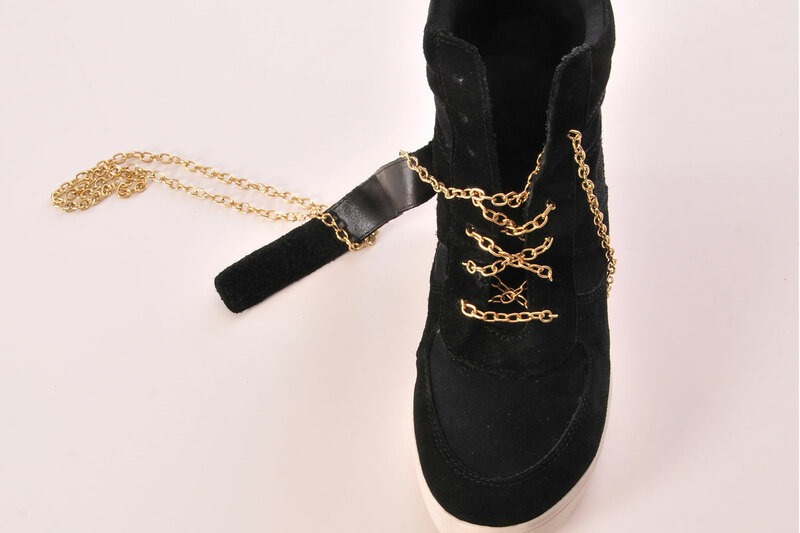 One pair of shoes, I looked for some without metal eyelets so the chain fits through the holes. 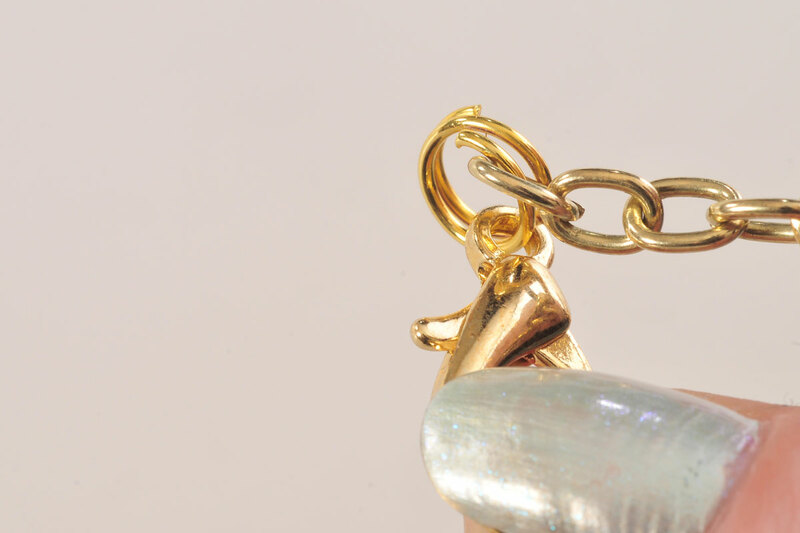 Open a split ring and connect your clasp to one end of your chain. 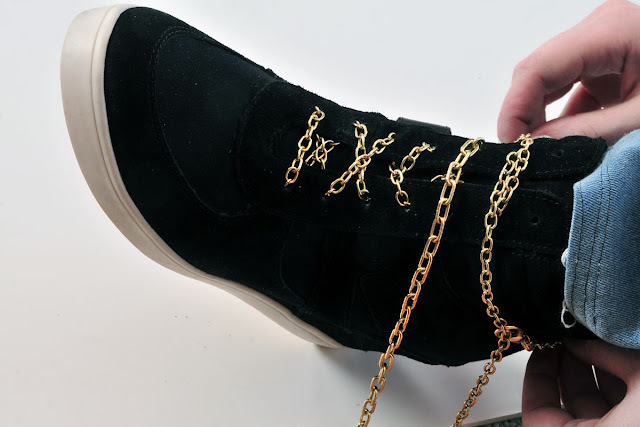 Begin lacing the shoe, you will be starting from the top outside leaving enough chain to wrap around your ankle not quite once (8"). I started on the second hole down. 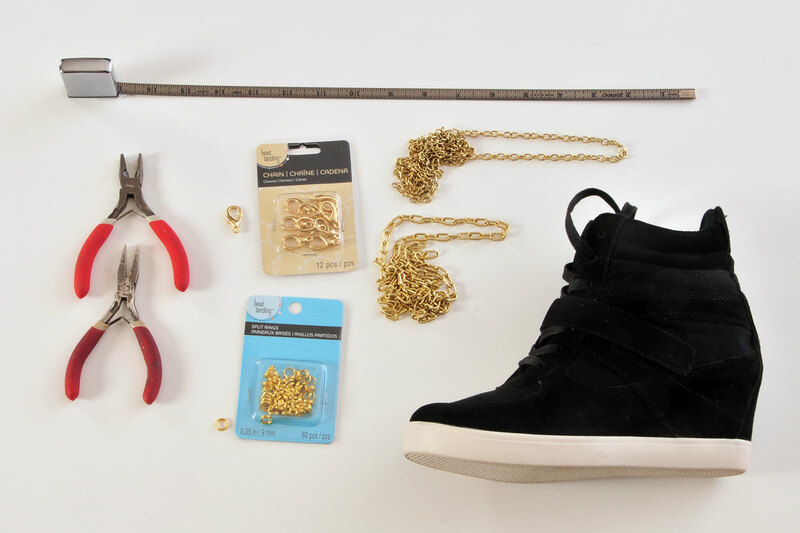 Think it through before you start, every pair of shoes is different, so your shoes might turn out a bit different. Lace all the way down and up again, ending two holes below where you started. You are now going to join another chain onto this chain. 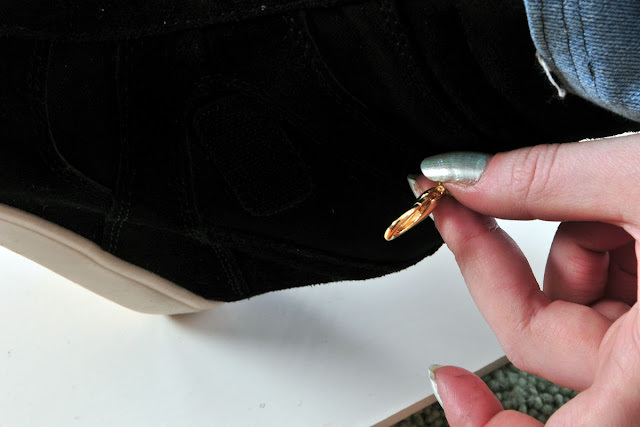 You will need to try the shoe on and see how the laces are fitting before the next step. Open a link at the end of your second chain, If you have never opened a jump ring before, watch this. 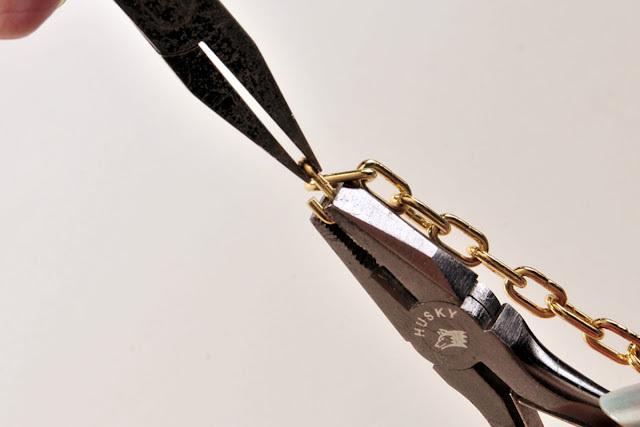 You will be attaching the second chain right here. Notice that at this point, I put the shoe on. You should do that now. This is how the lace looks with the second chain attached. Put the chains through the holes. ...and wrap it around the back of your ankle. It will cross over in front, go around the inside of your ankle and end up on the lateral (shoespeak for outside) side. You can now take the two non-lobster chains and clip onto them. I left some slack on one of the chains to get a layered look. Only one needs to be tight to hold your shoes on. Clip the extra length that will be left at the end of the lace. Now just do the same for the other shoe. Definitely a unisex look, not the wedge, just the chain. Or the wedge, why not. 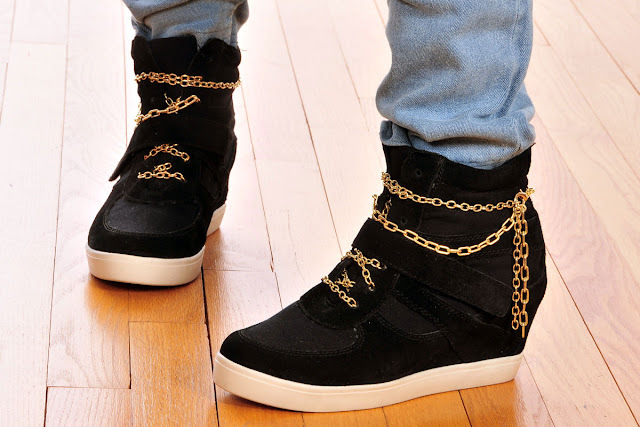 I'm sure the chains would look great with all sorts of shoes, not just sneaker wedges. In fact, there is a pair of Docs just waiting for a silver version of these.